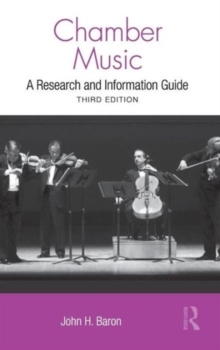 Chamber Music: A Research and Information Guide is a reference tool for anyone interested in chamber music. It is not a history or an encyclopedia but a guide to where to find answers to questions about chamber music. The third edition adds nearly 600 new entries to cover new research since publication of the previous edition in 2002. Most of the literature is books, articles in journals and magazines, dissertations and theses, and essays or chapters in Festschriften, treatises, and biographies. In addition to the core literature obscure citations are also included when they are the only studies in a particular field. In addition to being printed, this volume is also for the first time available online. The online environment allows for information to be updated as new research is introduced. This database of information is a "live" resource, fully searchable, and with active links. Users will have unlimited access, annual revisions will be made and a limited number of pages can be downloaded for printing.